We nod our heads to the Reiss family who opened their hearts and home to Merle nearly 10 years ago. His update is bittersweet. This message was received from his humans in late July, "Sadly, after enjoying his company for nine plus years, we had to put Merle (who we renamed Jasper) to sleep this past weekend. He was a wonderful dog, and was in so many ways, a gateway dog allowing us to adopt many rescues over the years because he was so welcoming and friendly to all." Run free Jasper, you were very loved! Quincy K-9 Connection helped this cutie earlier this year. This is the message we received from his new mom, "Hi there just wanted to let you know Spanky is doing great and we love him so much! Our other cat does too.."
Rusty was transported in to the arms of his rescue organization in September when the health of his elderly human daddy worsened. We are happy to report that Rusty, too, was recently adopted. He is once again enjoying being in a home. Never underestimate your charming ways handsome boy! Smiley Miss Penny was transported by QK9C to her rescue in August. 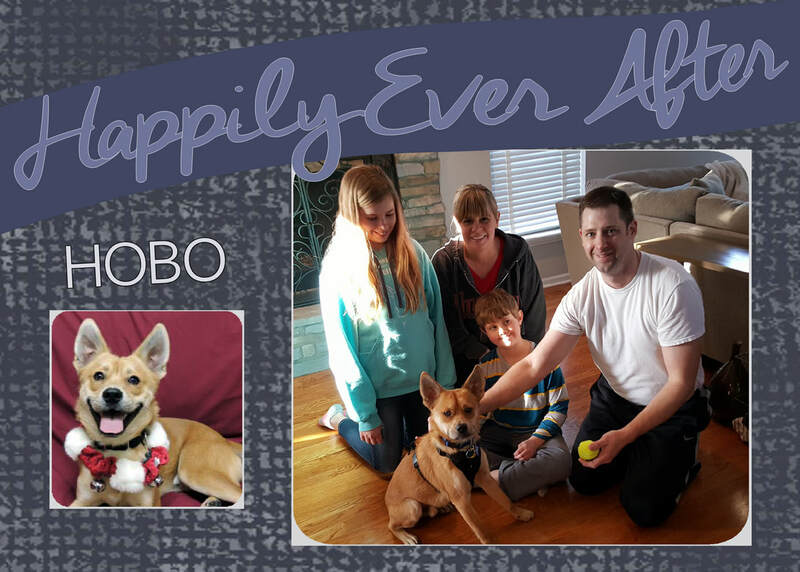 Earlier this month, she wiggled her way into the hearts of her forever family. This is what they had to say, "Just wanted to let you know "Penny," now known as Harley has settled in perfectly...she is amazing and already behaves like she's been here her whole life. We can't thank you enough!" Enjoy that couch Baby Girl, you deserve it!! The SUPER friendly Casper was transported to his rescue by us in June. He captured the hearts of nearly everyone who met him. 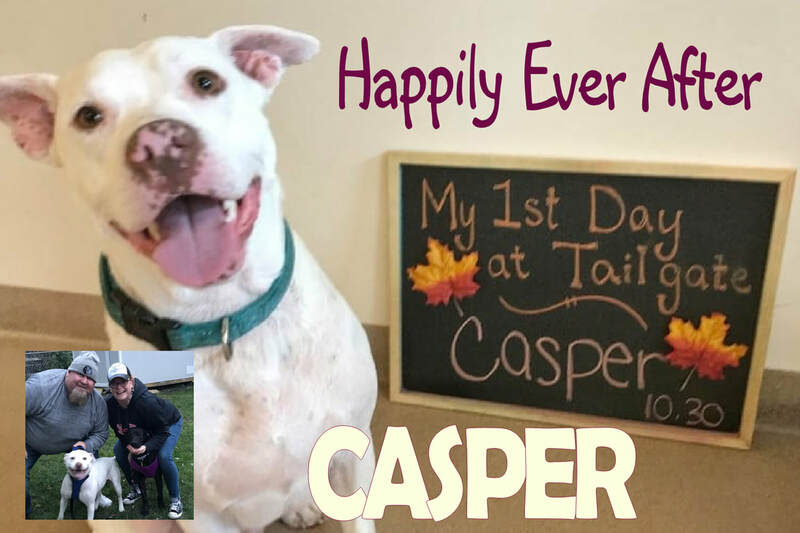 It wasn't until late October, however, before Casper was welcomed into the Dykstra household. He now has a canine sibling to play with and he attends doggie daycare! Good things come to those who wait Casper! You have hit the jackpot buddy!!! Quincy K-9 Connection transported Auggie to his rescue in late October. He is now in a forever home where he is helping to heal the hearts of his new, doodle-loving family who lost their previous doodle to cancer. Good job Auggie! Quincy K-9 Connection helped Rocky (a handsome, 3 legged boy) get to rescue in early June. 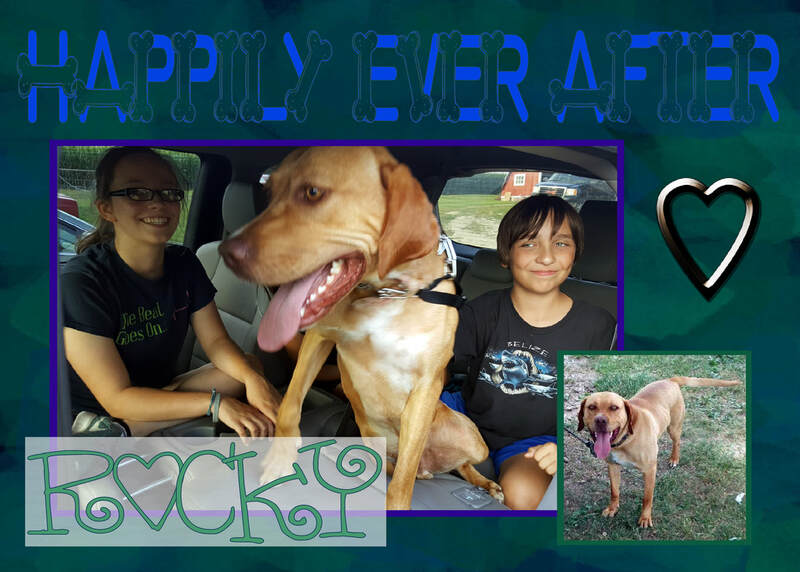 On July 31 , we received word that Rocky had been adopted. Looks like he was pretty darn eager to check out his forever home in this picture! "I want to thank you for taking a few minutes yesterday to talk about Appee. This lovely lady has touched my heart in such an amazing way in the short time I’ve known her. She lights up the face of everyone that comes in contact with her and certainly pulls on their heart strings with her calm/sweet demeanor. I’m so grateful that she found her way to UMGDR so she can have a chance at a better life, a life period for that matter. . . "
"I wanted to give you an update on Appee. She is doing exceptionally well and we have quickly become great pals!! She is the sweetest thing ever. We have an appointment to repair the spot on her hip and possibly remove a brokers K-9 on August 17th. So I’m blessed to have her in my life for at least five more weeks. She is in great hands!! She is a rockstar and quickly making us the talk of the block ... She absolutely loves our lake walks!!!" "Adoption is officially closed so she is mine. I cried, she licked my tears, and then we cuddled this weekend." Yay Appee!!! We are beyond thrilled for both you and your daddy! Think environment makes a difference? Just ask Shaggy .... errr, we mean Penny. When we networked to find Shaggy a place within a rescue organization, we believed SHE was a senior HE . . . yikes! What an insult for ANY lady. Thank goodness Albert's Dog Lounge correctly identified Shaggy as a female and erased some years from her estimation. Shaggy is now known as Penny and is believed to be only 4 years old. Want more? Penny has snagged herself an awesome home. We love you Penny and are very happy for you! You are a beautiful girl! 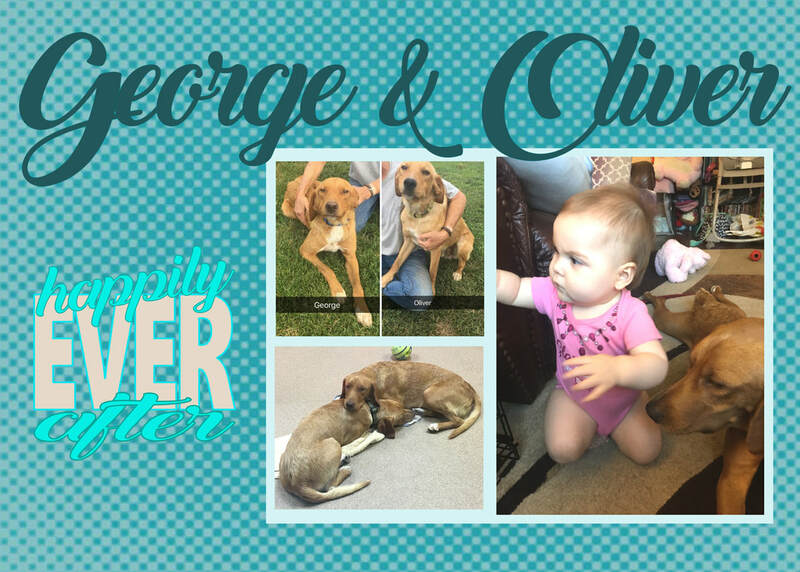 "George and Oliver .... are doing great. They both went to houses with a cat and both are afraid of the cat. Both are learning very quickly on leash training and housebreaking. George went to a home with a 1 year toddler, and he just loves her. See attached pic. Each family cannot believe how much love these boys want and give back. They both are eager to please and fast learners." Good job George and Oliver! Quincy K-9 Connection is so proud of you both and thankful to The Buddy Foundation for accepting you into their care! 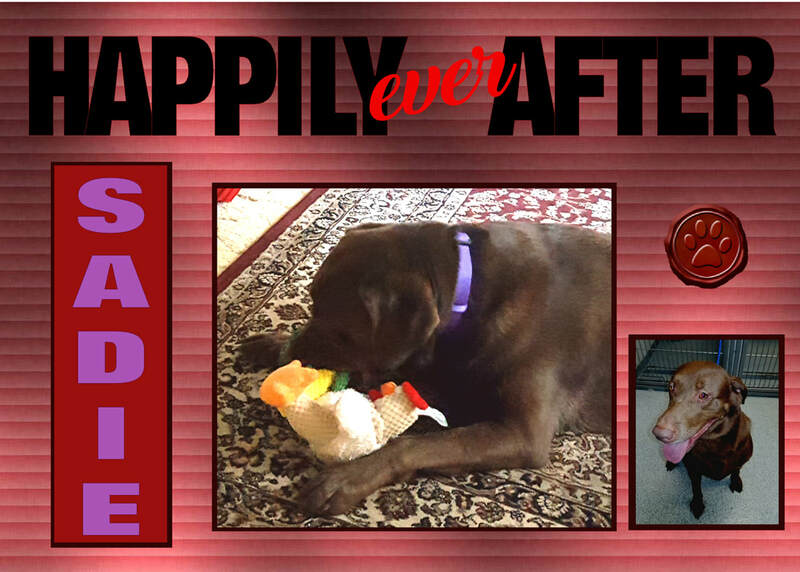 "​We recently adopted Tootsie from Love of Labs Indiana. We just finished her first visit to our veterinary office. We noticed the K-9-c transport which led us to your website. We want to send a BIG THANK YOU to everyone at K-9-c  Tootsie, which we have changed to Sadie, is doing great! Thank you for all you do!" "Now that I’ve had a chance to spend the entire weekend with Charlie, I can honestly say I could not imagine life without her. We had a very busy weekend, we took lots of walks a couple of car rides and even went to the dog park, Oh yes and I forgot to mention we went shopping and spent lots of money at the pet stores. Charlie enjoyed shopping in the pet stores as well as meeting other fur babies. She even let me give her a bath. I can honestly say she is the sweetest girl . . . "
Bruno is an ADORABLE and SWEET boy we transported on June 9th. We are so excited that he has found a home to share his awesomeness with. Here, Bruno is pictured with his new family, Ivan and April who say, "He is just perfect, we couldn't be happier! He loves going for walks and cuddling on the couch. We are working on some basic commands - sit, stay, come - and he's picking them up so quickly!" It's always so nice to find out what wonderful lives our passengers get adopted into! Here are two great examples. We transported handsome Jake to his rescue organization on May 26th. This is a picture of Jake enjoying his vacation in Wisconsin Dells with his new family. We transported gorgeous Hazel to her rescue organization on June 9th. Here, she is pictured soaking up the attention of a young man in her forever home. The calico baby, Gabby, was transported on May 5th. This sweetheart knew how to work the charm and captured the heart of one of our drivers. That driver ultimately decided to adopt Gabby. Gabby is pictured here with her new mama's granddaughter. Buddy was transported by us on May 19th. 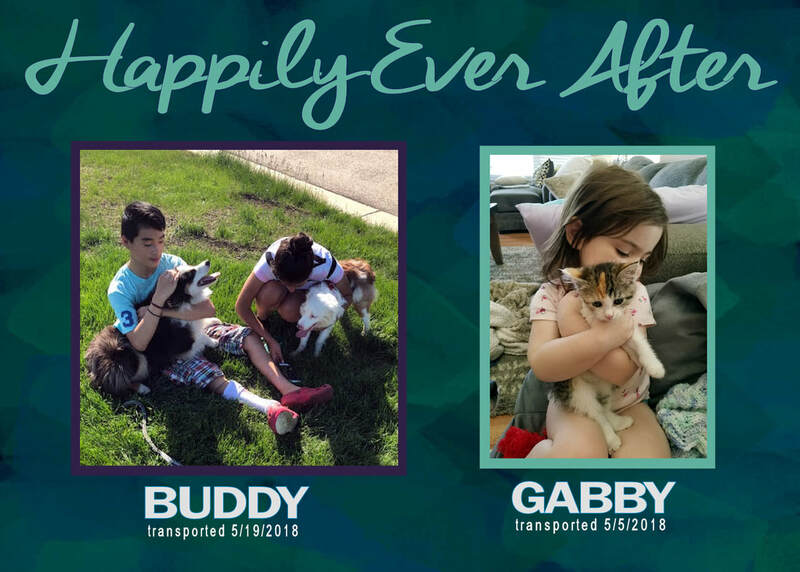 Approximately 8 days later we received this adorable adoption picture of Buddy with some of his new family members. QK9C transported Ginger on May 12th. 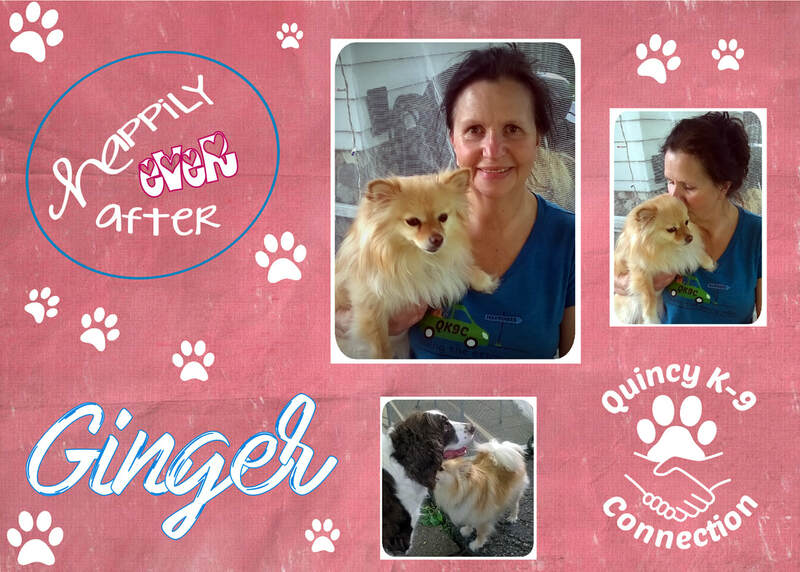 One of our transporters thought Ginger might be the perfect match for her neighbor, Adele. She was right. Adele and Ginger met and quickly fell in love. Adele adopted Ginger and they have never looked back. Congratulations Adele and Ginger, we are so happy for you both! ❤️❤️❤️ p.s. We LOVE your QK9C shirt Adele! "Sometimes us volunteers wonder why things happen the way they do. This gorgeous fur-baby named Baine waited so long and had so many "almost" homes. Along the way he was the reason another dog had a life saving blood test to detect heart worm disease. After so many "almosts", Baine finally found his family. Now we know why things happen the way they did. He was waiting for his special rescue big brother! . . . "
Click here to watch me meeting my new dad! ​... He was placed as our first dog with a group that works with vets dealing with PTSD. When they are ready, they are paired up with their own dog, and training them at the Center helps them adjust and heal. It’s called K9s for Vets. That’s him... sweet sweet dog! The video clip was his new “dad” meeting him for the first time. Afterwards the trainer there sent me this note: “Got to meet his new vet. Spent 2 hrs telling him he loved him and he would never walk alone. I cried watching him cry. Vet bought a fit bit for him and the dog. He will stay at the center and the vet will be coming 3 days a week to train with him. His first class is tomorrow. :) Zambini is now “Buddy”. He also has a mom now too!” When I jokingly said, “what-he’s not keeping the name Zambini?” she responded, “the vet said, “Zamm what?! ?” Lol! 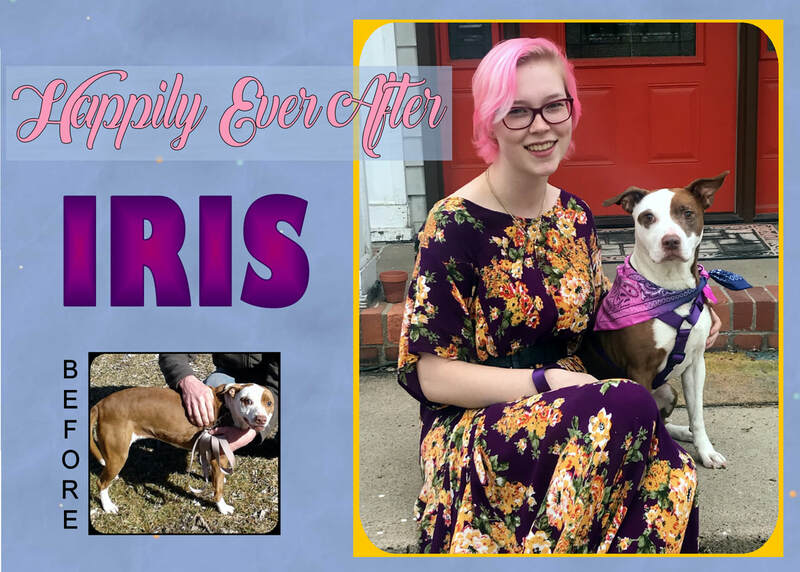 "Iris got adopted today!!! Claire is thrilled with everything about Iris and when I asked at one point after they first met what she thought of Iris, Claire said "She is Awesome!" We think Iris felt the same way about Claire." We wish Iris and Claire the happiest of futures. What a lovely duo! Quincy K-9 Connection helped find Penny (formerly known as Princess) find her way to rescue in mid-March. The girl is ALL about LOVE!! We actually had a hard time determining what commands she knew because all she wanted to do was go from person to person collecting love. 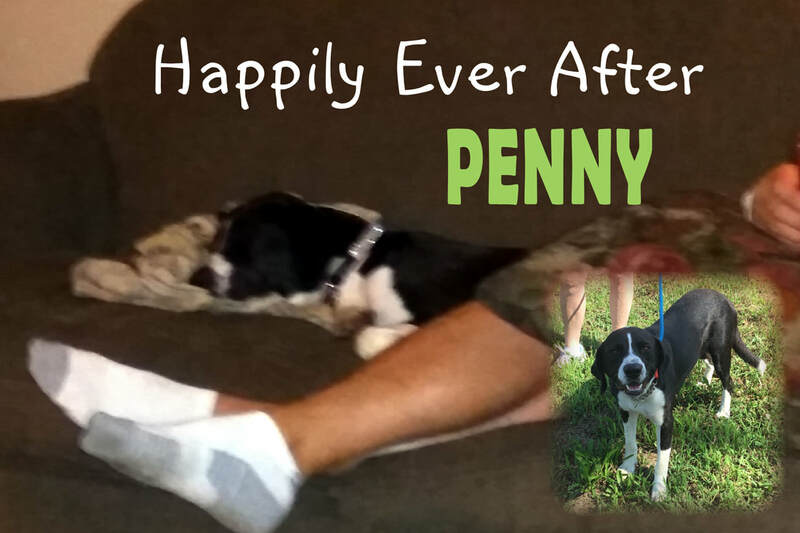 "Princess (now Penny), got adopted!! 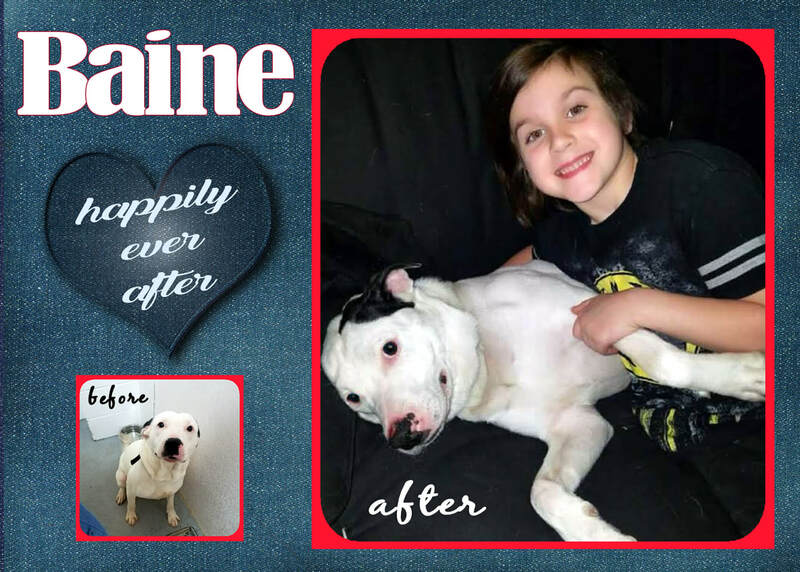 She was a foster success, she successfully convinced her foster family that they should keep her. She fits their family so perfectly! Penny is their first bull breed dog and I think she's a great dog for a first time pibble owner. She and Clark (the red dog next to her) are best buddies. Thank you for everything you did for Princess/Penny." Quincy K-9 Connection helped this sweet baby find new hope in January . . . after she had lived outside for quite some time. This is the update forwarded to us from her rescue organization. -The Babusiak Family with Xena,  adopted 03/31/18"
"What a wonderful little boy. A happy, well rounded dog. Got along with everyone and everything including the 2 resident dogs in his foster home and another foster dog that came in after he did. His foster home really enjoyed him and his new family is in love. 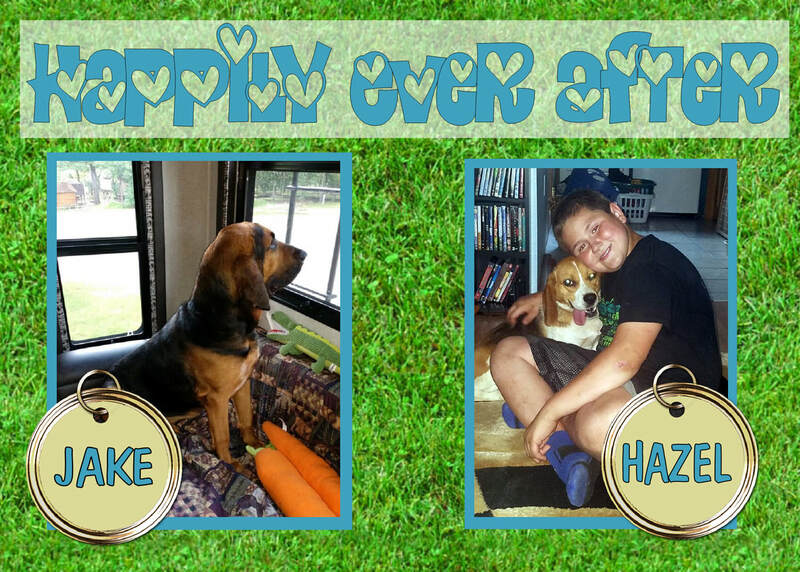 They made sure to have all the supplies he would need and everyone is going to share in the responsibilities of having a dog as part of the family." Good job Hobo! 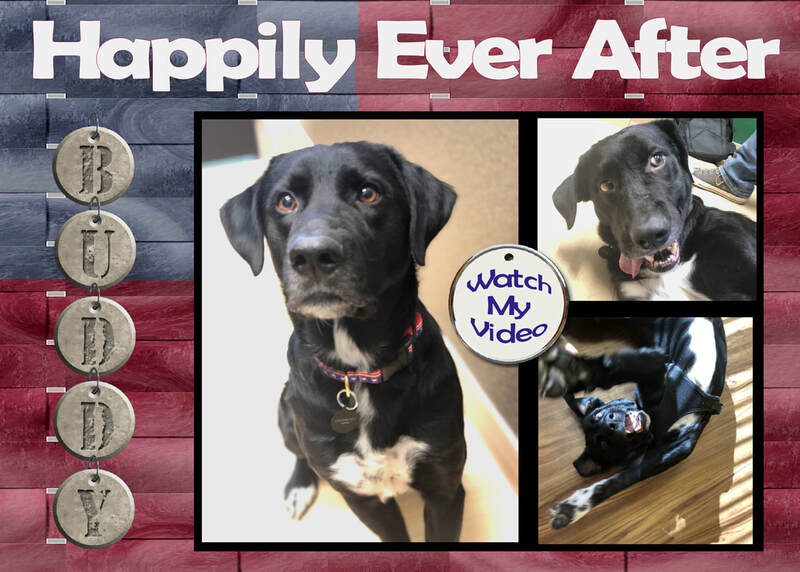 Quincy K-9 Connection is proud to have played a role in your new happiness! DID YOU KNOW? Quincy K-9 Connection helps to save more animals than you see on our weekly transportation collages. Sometimes we help needy animals find rescue organizations, but different travel arrangements are made (outside of our Saturday morning transports). Here are 2 of those special pups. Storm is a blind, but gorgeous blue and white pit who was recently adopted. Bailey is a Shar Pei who was recently rescued and placed in foster care. 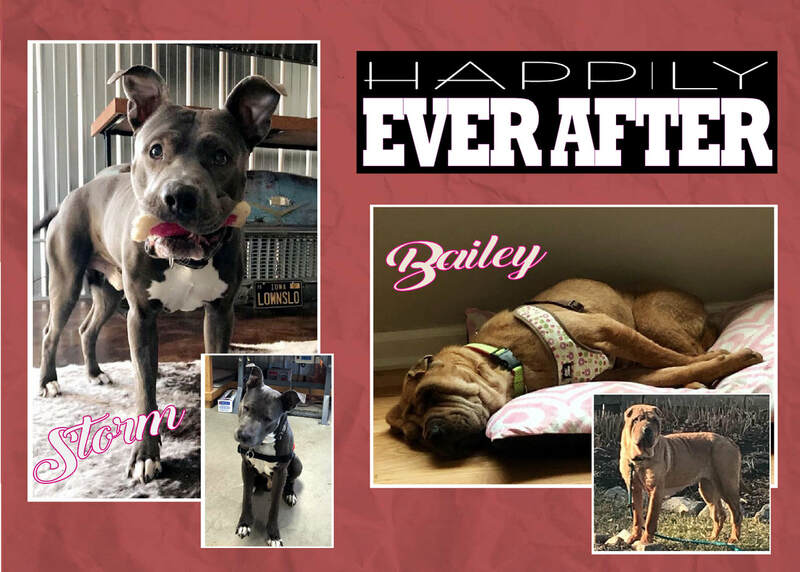 Once her ear and eye infections resolve and she receives necessary treatments to become "adoption-ready", Bailey's foster home is looking forward to becoming her forever home. The future is looking bright indeed to both Storm and Bailey. Quincy K-9 Connection found the handsome King placement with a rescue organization in early February. We are beyond happy to learn that he has been adopted. We think his video speaks volumes as to his future. Smart boy! "Maggie was transported to a GLBCR foster at the end of October 2017. I am that foster, and we adopted Maggie after Christmas. She is quite the little character and we love her so much. Maggie has just started puppy agility and will fly once she puts it all together! Callie, shown with her PilotsNPaws crew, was adopted to a wonderful family in Michigan about two weeks ago. Squirt, who came on the January 6, 2018 transport with Callie, came to my house to be fostered for the GLBCR. I just drove Squirt (now Dexter) to his wonderful forever home in Michigan on Friday, March 2. I had a DNA test done on Dexter (Squirt) and he is mostly Border Collie mixed with….Great Pyrenees!" 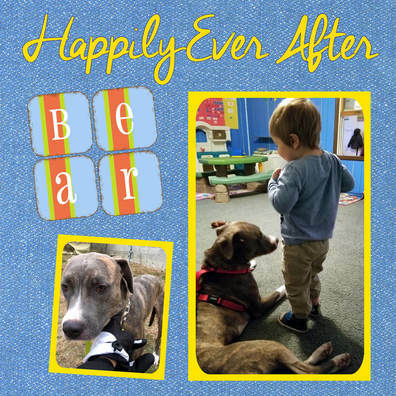 "My husband and I adopted Baron two weeks ago and he has truly been the best addition to our home and my classroom! I am a high school teacher and my principal has allowed me to bring Baron to work with me. My students love him almost as much as we do. Thank you to all the hard working people who work with K9 Lifeline who rescued this sweet pup, his litter & tons of others." Surprises come in all shapes and sizes . . . We transported lovely Morgan to her rescue organization on 10/7/2017. As it turns out, she had a secret. When she presented at the vet for her spay appointment, the vet discovered she was a mama-to-be. Morgan gave birth to 6 puppies. We are happy to report that all the pups have found loving homes. Morgan, herself, was also adopted in February. Just for the record, she will be having NO MORE puppies. ​Quincy K-9 Connection transported Bear to his rescue organization on 12/23 after his owner was deployed. We are happy to report he has been adopted and is already demonstrating what a WONDERFUL boy he is! His mom runs a daycare and reports that Bear is AWESOME with both the kids and with their Chihuahua! You are special Bear and we are VERY happy for you Buddy!